I’ve previously covered recommended comics for Superman, Batman, and Wonder Woman. Thus, here’s a list of recommended comics for their Justice League pals, as well as the rest of the DC Comics roster of characters. Again, I try to favor trade paperbacks over single issues (or the expensive Archives editions). While I’ve offered a mix of material and eras, don’t expect New 52 material here. Green Lantern: The Greatest Stories Ever Told. Showcase Presents. Black-and-white reprints of Silver Age Green Lantern stories. Green Lantern/Green Arrow. The classic early 70s stories teaming up Oliver Queen and Hal Jordan. Green Lantern: A Celebration of 75 Years. Showcase Presents. Black-and-white reprints of Silver Age Flash stories. The Flash: A Celebration of 75 Years. A few extra Wally West-era stories are included here over the “Greatest Stories” volume. Mark Waid’s run. Wally West fans will want the various trade paperbacks of Waid’s 90s run. However, checking Amazon, they seemed either expensive or out-of-print. The Flash: Season Zero. The digital comic based on The CW “Flash” TV show. Showcase Presents. Black-and-white reprints of Silver Age Aquaman stories. Death of a Prince. The storyline collecting the death of Aquaman’s son at the hands of Black Manta. Justice League of America: The Greatest Stories Ever Told. Justice League of America: The Silver Age, vol. 1. Color reprints of the earliest JLA stories in a cheap trade paperback. Showcase Presents. Black-and-white reprints of the Silver Age JLA run. 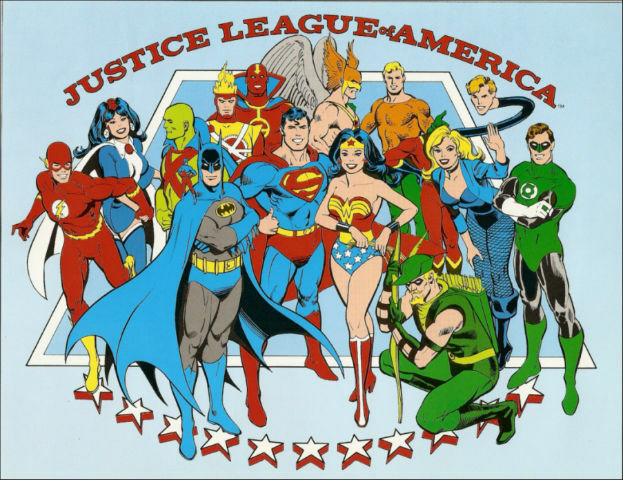 Justice Society of America: A Celebration of 75 Years. America vs. the Justice Society. A miniseries that ran in the 80s that basically collected the entire pre-Crisis history of the JSA, as retold by Roy Thomas. The story features the JSA accused of treason. Crisis on Multiple Earths. All of the classic Silver/Bronze Age JLA-JSA team-ups. Crisis on Infinite Earths. The 1985-86 miniseries that ended the pre-Crisis era at DC Comics, and led to their various wholesale reboots of Superman, Wonder Woman, etc. in the mid-80s. DC: The New Frontier. The miniseries by the late Darwyn Cooke about the DC superheroes (and future JLAers) mainly during their down period in the 1950s. The New Teen Titans. The early-to-mid-80s run is mostly collected in trade paperbacks by now. Teen Titans Go. This comic has had two runs, both based on the 2000s and 2010s “Titans” TV shows. Fans of the non-comedic 2000s animated series will want the trades of the original “Go” run. Tiny Titans. The kid-oriented series featuring the Titans engaged in amusing misadventures. Featured a crossover with the cast of Archie (in their “Little Archie” grade-schooler personas). Showcase Presents. Black-and-white reprints of the Legion’s Silver and Bronze Age runs. The Great Darkness Saga. The return of Darkseid threatens the world of the 30th century. Shazam! The Greatest Stories Ever Told. Shazam! : A Celebration of 75 Years. Showcase Presents: Shazam! The 70s Captain Marvel revival is mostly collected in this black-and-white edition. However, one story and an entire cover are missing. Both were crossovers with the TV version of “Isis,” which DC no longer had the rights to reprint. The Power of Shazam! The 90s series of Captain Marvel stories unfortunately don’t seem to be fully collected. But I’ll still list it here anyway, in case one’s OK with single issues and/or it does eventually get reprinted as a trade. Shazam! : The Monster Society of Evil. Jeff Smith’s 2009 trade paperback. The Sandman. Neil Gaiman’s Vertigo series is too popular to not list here, I suppose. Sandman Mystery Theatre. A Vertigo series set in the late 1930s, about the early adventures of Wesley Dodds, aka the Sandman. Astro City. While this one’s been released through other publishers, its current home is with Vertigo. Kurt Busiek’s series about the lives of various people in a superhero-filled city is a classic. Showcase Presents: Captain Carrot and His Amazing Zoo Crew. Until some color trades featuring the Zoo Crew are released, this is the most complete collection we’ve got. The trade paperback of the late-2000s’ “Final Ark” miniseries is also available. That sums up DC Comics’ non-Batman, -Superman, and -Wonder Woman side of things. Of course, it’d be a lot easier to recommend stories not collected (outside of expensive Archives editions) if DC ever considers a service similar to Marvel’s Marvel Unlimited. There’s also some stuff hard to find in trades (or not completely reprinted), such as Milestone’s Icon and Static comics. Do you have any favorites not listed here? Let me know in the comments.